Restriction enzyme digestion takes advantage of naturally occurring enzymes that cleave DNA at specific sequences. 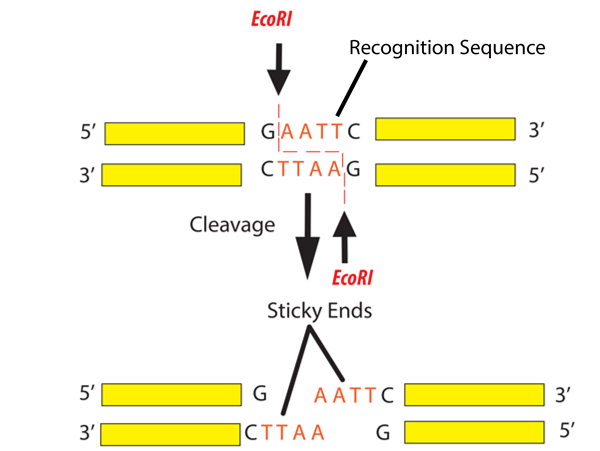 There are hundreds of different restriction enzymes, allowing scientists to target a wide variety of recognition sequences. For a list of many commonly used restriction enzymes, visit NEB. Restriction enzyme digestion is commonly used in molecular cloning techniques, such as PCR or restriction cloning. It is also used to quickly check the identity of a plasmid by diagnostic digest. Watch the video below to learn how to analyze your restriction digest results. 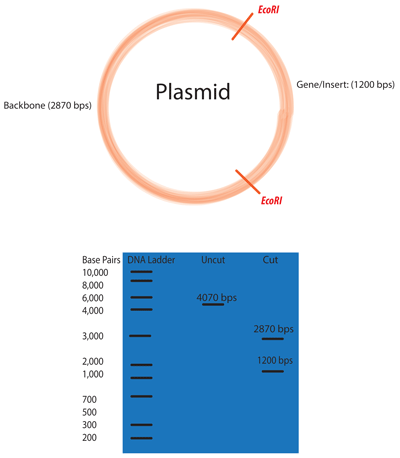 Select restriction enzymes to digest your plasmid. *Pro-Tip* To determine which restriction enzymes will cut your DNA sequence (and where they will cut), use a sequence analysis program such as Addgene's Sequence Analyzer. Determine an appropriate reaction buffer by reading the instructions for your enzyme. *Pro-Tip* If you are conducting a double digest (digesting with two enzymes at the same time), you will need to determine the best buffer that works for both of your enzymes. Most companies will have a compatibility chart, such as the double digest finder tool from NEB. *Pro-Tip* The amount of DNA that you cut depends on your application. Diagnostic digests typically involve ∼500 ng of DNA, while molecular cloning often requires 1-3 µg of DNA. The total reaction volume usually varies from 10-50 µL depending on application and is largely determined by the volume of DNA to be cut. *Pro-Tip* The amount of restriction enzyme you use for a given digestion will depend on the amount of DNA you want to cut. By definition: one unit of enzyme will cut 1 µg of DNA in a 50 µL reaction in 1 hour. Using this ratio, you can calculate the minimal amount of enzyme for your reaction. However, keep in mind that restriction enzyme activity is determined under ideal conditions with very clean DNA, so using a little more enzyme is advisable. Reactions are often performed with 0.2-0.5 µL of enzyme because it is difficult to pipette less volume than this; 0.2-0.5 µL will likely be more enzyme than you will need, but that's okay because a little more enzyme is usually better. Incubate tube at appropriate temperature (usually 37 °C) for 1 hour. Always follow the manufacturer’s instructions. *Pro-Tip* Depending on the application and the amount of DNA in the reaction, incubation time can range from 45 mins to overnight. For diagnostic digests, 1-2 hours is often sufficient. For digests with >1 µg of DNA used for cloning, it is recommended that you digest for at least 4 hours. *Pro-Tip* If you will be using the digested DNA for another application (such as a digestion with another enzyme in a different buffer), but will not be gel purifying it, you may need to inactivate the enzyme(s) following the digestion reaction. This may involve incubating the reaction at 70 °C for 15 mins, or purifying the DNA via a purification kit, such as a QIAGEN DNA cleanup kit. See the enzyme manufacturer's instructions for more details. To visualize the results of your digest, conduct gel electrophoresis. Restriction enzymes MUST be placed in an ice bucket immediately after removal from the -20 °C freezer because heat can cause the enzymes to denature and lose their function. If you are having difficulty finding an enzyme that cuts your vector's multiple cloning site (MCS), but does not cut your insert, you could try using two different enzymes that have compatible sticky ends. See NEB's compatible cohesive ends chart. If you cannot find compatible sticky ends, you will need to fill in the overhangs and conduct a blunt end ligation. Use T4 DNA Polymerase or Klenow DNA Polymerase I for 3′ overhang removal and 5′ overhang fill-in. If you are using blunt ends or a single enzyme to cut the vector, you will need to use a phosphatase to prevent re-circularization of the vector if you are cloning in an insert. CIP (calf alkaline phosphatase) or SAP (shrimp alkaline phosphatase) are commonly used. Follow the manufacturer’s instructions. If your enzyme did not cut, check to make sure that it isn't methylation sensitive. Plasmids grown in Dam or Dcm methylase positive strains will be resistant to cleavage at certain restriction sites. See NEB's table of methylation sensitive restriction sites. Sometimes enzymes cut sequences which are similar, but not identical, to their recognition sites. This is due to "Star Activity" and can happen for a variety of reasons, including high glycerol concentration. Learn more at NEB's website about star activity. If you are digesting a large number of plasmids with the same enzyme(s) (for instance, in a diagnostic digest), you can create a "Master Mix" consisting of all of the reaction components except for the DNA. Aliquot your DNA into individual tubes and then add the appropriate amount of Master Mix to each tube. This will save you time and ensure consistency across the reactions.